Khan lined up for some big fights in 2018. British former light-welterweight world champion Amir Khan will return to the ring for the first time in almost two years with a fight at Liverpool’s Echo Arena on 21 April. 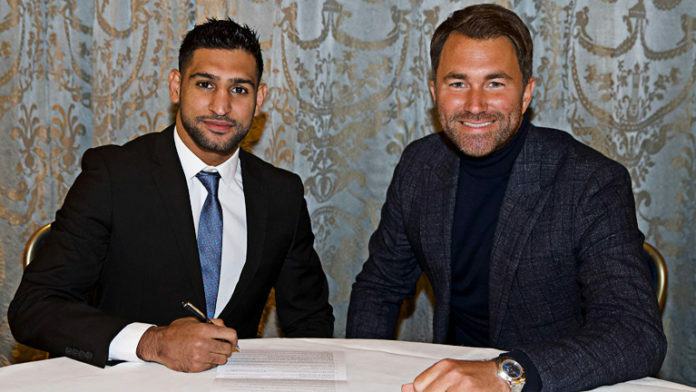 Shockingly Amir Khan has signed with Matchroom Boxing, under Eddie Hearn – this will come as a surprise to many boxing fans due to the amount of ‘bad blood’ there has been between the two. Especially since Eddie promotes one of Amir’s biggest domestic rivals Kel Brook. Amir Khan hasn’t fought in almost two years since he was sensationally knocked out by Mexican superstar Saul ‘Canelo’ Alvarez at the T-Mobile Arena, Las Vegas in May 2015. His come back could be interesting with strong rumours that his warm up fight will be against Birmingham prospect and Barry Hearn favourite Sam Eggington. He has also been called out by the new IBF Welterweight World Champion and Kel Brook conquering Errol Spence Jr, Saying “ld be happy to fight Amir Khan”, who he says is a bigger name than Kell Brook. The American makes the first defence of the IBF welterweight title he prised away from Brook against former Khan opponent Lamont Peterson on 20th January.